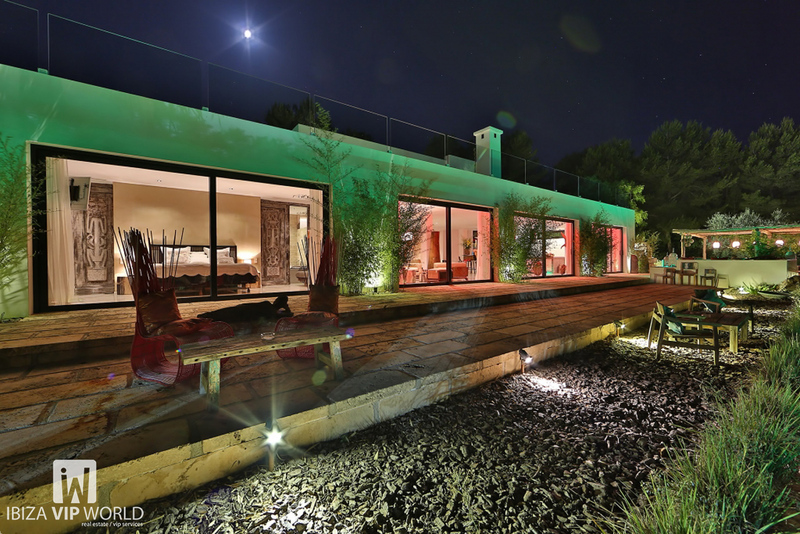 "Villa Julia” is a luxurious house of 411m2 with 600m2 plot in Can Pep Simó urbanization. An elegant area elevated a few kilometers from downtown Ibiza, near Talamanca beach and Cala S'estanyol, the seaport and Pacha. "Villa Julia" has outstanding sea and mountain views. There are three levels with elevator in this modern Ibizencan house. At the entrance, 2 cars garage and an apartment with separate entrance, the apartment has a spacious living room with TV and exit to the backyard (playground for children if requested), room with two single beds and with separate bathroom with shower. On the ground floor the house has a large kitchen fully furnished, with a side room for reading and games for children, laundry room, WC toilet, living and dinning room with stereo and satellite TV. From here there is access to the terrace and garden, hammock and sofas area very quiet. Private swimming pool with movable protection for children. Shower, Barbecue and outdoor dining in the shade for 10 people. 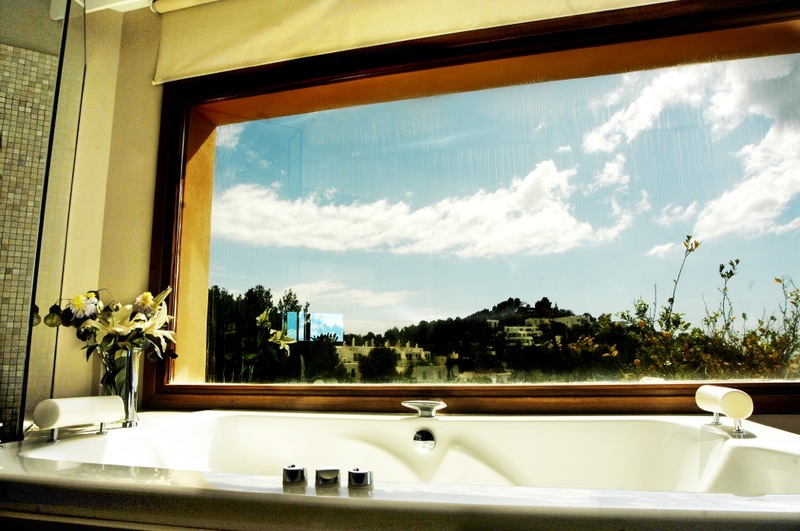 On the first floor there is 1 bedroom suite with dressing room, bathroom with shower & jacuzzi and a beautiful view. Another bedroom suite with terrace, bathroom and shower. 2 bedrooms with two single beds and one external bathroom with shower-bath and two sinks. New Villa Talamanca - Destino in Cap Pep Simo. 450M2. 4 Double Bedrooms and 4 en-suite bathrooms. Swimming Pool Sea overview. Air-conditioning in all the rooms as well as in the living room. Lift. It is located in Cap Martinet just 3 km away from Ibiza centre. It comprises 4 bedrooms (which one is independent of first floor w/bathroom next to the kitchen). Parking, swimming pool, Jacuzzi, Chill out area. Stunning views to Talamanca beach. Está situada en cap martinet a escasos 3 km de Ibiza. Tiene cuatro dormitorios uno de ellos ubicado en el apartamento independiente de la primera planta junto con su cocina y su baño correspondiente. Plaza de aparcamiento, piscina, jacuzzi, chill out. Sitting room with terrace facing the sea front, few steps away from Marina Ibiza Nueva and opposite Ibizas walled site Dalt Vila. - With a dinning table and 4 chairs. 2 bedrooms, main with terrace facing the sea front, few steps away from Marina Ibiza Nueva and opposite Ibizas walled site Dalt Vila. - One king size bed in each room. 2 bathrooms and a guest toilet. 2 Terraces. Sitting room terrace has the following furniture; sofa and outdoor dinning table with 6 chairs. Main bedroom terrace has the following furniture; chill out sofa. Complete kitchen with crockery, cutlery, blender and Nesspresso machine. Fridge, dish washer and washing machine. You will find when you arrive a bottle of water (sparkling and still) plus a bottle of rose cava ready for you! Tv has diferent channels, don't waste time watching, theres lots of things to do! You have fridge, dish washer and washing machine, this last one is in a cupboard right after the tv. Its a washing and drying machine also, it washes up to 8kg and dries up to 6kg. Glasses, cutlery, scissords and wine opener you can find them under the tv. Plates and dishes are in the cupboard at the kitchen, pans and pots also. Oven is also microwave it`s easy to handle. Induction plates only work when you put a pan o pot on top with whatever you want to cook. You have a Nesspresso coffee machine and a blender. Picture of the girl has led light behind creating a cool atmosphere. Sideboard cupboard under tv and in main bedroom also have led light. Siting room has full access to terrace, you will find the left window is fixed, all the rest will open completely. Main bedroom has also full access to the terrace. There is a safe deposit box. Please remember taking your personal belonings the day you leave!!! It will avoid you loosing the plane!!! This is a non smoking house, please if you smoke do it at the terrace and put ashes and finished cigarettes in ‎ashtray! ASCARI is offered in pristine condition following a 2015 refit, The yacht accommodates 8 guests in 4 newly-refitted cabins and light, stylishly finished living spaces. Deck spaces on her sleek and sporty exterior include 3 separate sunpads and an aft deck terrace for intimate dining, and she is equally suited to relaxed, family charters or day charters. A cruising speed of 22 knots (top speed 30 knots) enables fast passages and maximizes adventure on the water, allowing guests to see more of their chosen destination. 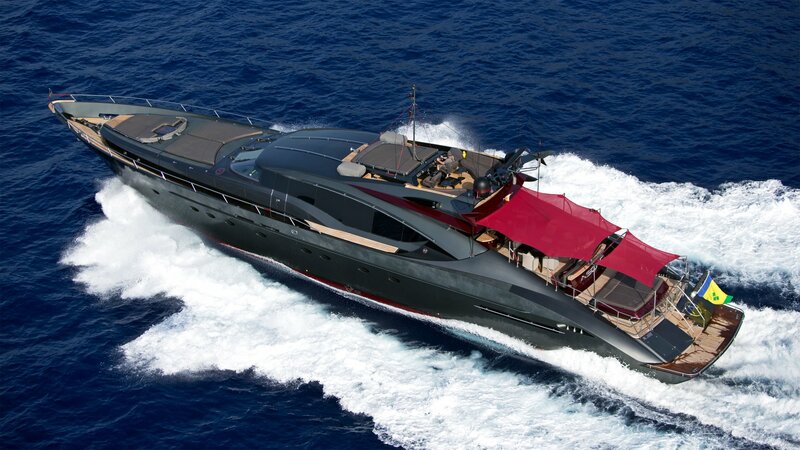 She is based in Ibiza year round and is the ideal yacht for cruising this lively area in style. This is a truly magnificent yet charming modern property located on the islands southern coast. The villa is architecturally delightful with an abundance of angles, clean lines and a thoughtful use of materials throughout. Creating a wonderful, inviting space that is totally functional and easy to enjoy. 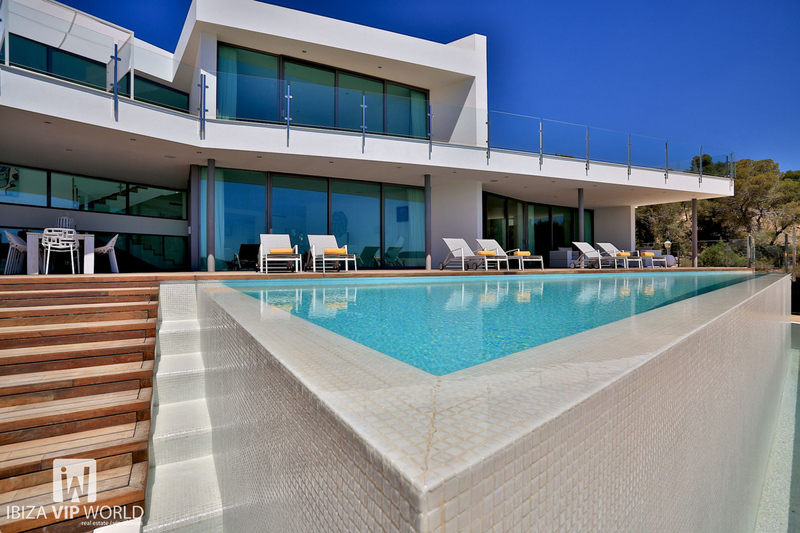 The properties frontage is covered with sliding glass walls and windows allowing the stunning views over Cala Yundal, Porroig, Formentera and the sea to been seen from practically everywhere in the Villa. Situated only minutes away from some of Ibiza’s best beaches and set in a totally enclosed secure plot of 1.920 m2. 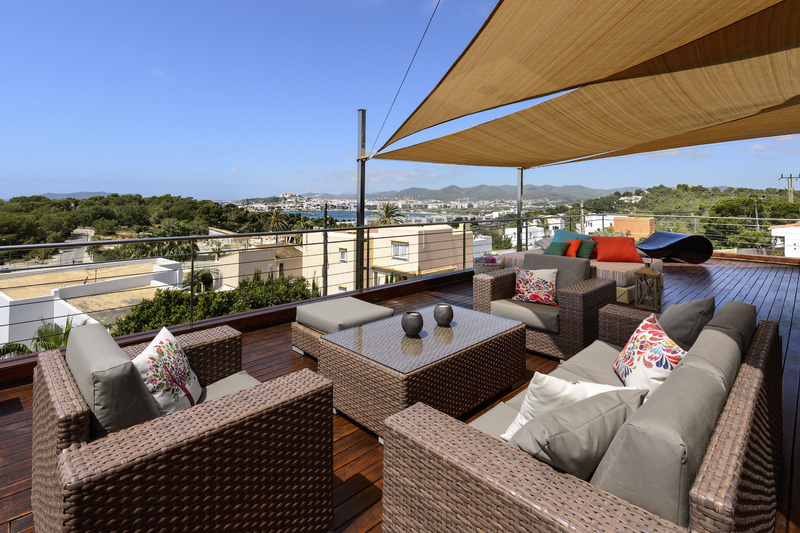 This property of 600 m2 has everything you could desire to ensure your stay in Ibiza is totally perfect. From the courtyard and up a few small steps you are greeted by the villas beautifully handcrafted 2.4 x 2.6m solid wood pivoting door that leads in to the entrance hall, a sumptuously decorated guest cloak room, internal garden with specimen olive tree and bar area. The living dining and kitchen areas combined are just over 130m2 although each are separate from one another, clever design gives these spaces a wonderful, united, open plan feeling that is relaxed friendly and warm. The living area has been tastefully decorated using only the best materials, furnishings and modern art. Creating two separate seating areas. One around the Balinese limestone and black granite fireplace/entertainment area, and another featuring oversized comfortable sofas. Creating the perfect spaces to entertain friends over cocktails or to relax and enjoy the stunning views through the sliding glass walls that lead out to the sun deck and pool area. The dining area is situated just next to the main living room behind a partial wall, allowing the spaces to appear separate while remaining totally connected. Again this room has been lovingly appointed with beautiful furnishings and modern art to create a warm inviting area perfect for dinner parties and entertaining friends. Sliding glass walls again lead out to the pool and sundeck area. The properties BOFFI fitted kitchen with its clean lines and white Corian surfaces will be the dream of any aspiring chef. Fully appointed with the best appliances from MIELE, GAGGENAU and BOFFI it is the perfect place for creating culinary masterpieces to delight your guests. Featuring two ovens, microwave, plate warmer, gas hob, wine chiller, dishwasher, ice machine, an expresso coffee station and separate pantry. The beautiful solid wood and glass staircase from the living area leads up to the feature wood sliding doors of the villas master suite. Standing at just a fraction under 55m2 this is the perfect place to unwind in total privacy and modern luxury. Relax as you lay in your bed and enjoy stunning panoramic views of Formentera, or venture out on to your very own private sun terrace with its double day bed to soak up the Ibiza sun. The master suite benefits from a huge dressing area and a stunning contemporary bathroom featuring underfloor heating, a ANTONIO LUPI free standing egg bath, Aquavision TV, twin basins, his and hers WC’s and a walk in rain shower. It would be easy to confuse any of the properties bedrooms as the master as they are all over 40m2 and are all equally well appointed and decorated with unique furnishings and modern art. The second ensuite double bedroom features panoramic views over Formentera through the sliding glass wall that lead out to a private balcony, custom built wardrobes and ensuite shower room with under floor heating. There is also another door that leads to a huge private terrace at the rear of the property perfect for whiling away the hours in total privacy. Located next to bedroom 3 down the stairs from the living area is bedroom 4, again this is a large angular double room featuring a sliding glass wall that leads out to the garden and pool area. Ensuite shower with separate WC and the highest quality fixtures and fittings. Is a private suite with direct access from the outside area. Perfect for those in your group requiring a little more privacy and seclusion. With its own TV and seating area and separate ensuite shower room. A mixture of modern and antique Spanish furniture give this space an eclectic cozy feel. The external areas of the property have been given exactly the same consideration as the inside spaces. Totally enclosed by a 1.8m wall and electric gates. The properties landscaped garden, traditional stone walls, wooden decking with shaded chill out area, BBQ and outside dining for ten people, and 45m2 iridescent pearl tiled infinity pool will ensure that anyone staying here will find the perfect position to relax and unwind. The continuation throughout the property is second to none and nothing has been missed. The entire property benefits from polished limestone floors, 20meg WIFI, integrated SONOS music system, hot and cold air conditioning system, feature hard wood doors, programmable lighting. The bedrooms all benefit from blackout drapes and all the bathrooms have underfloor heating. Vista Alegre is a truly exceptional property where attention to detail and thoughtful design create a functional yet beautiful space perfect for any group. 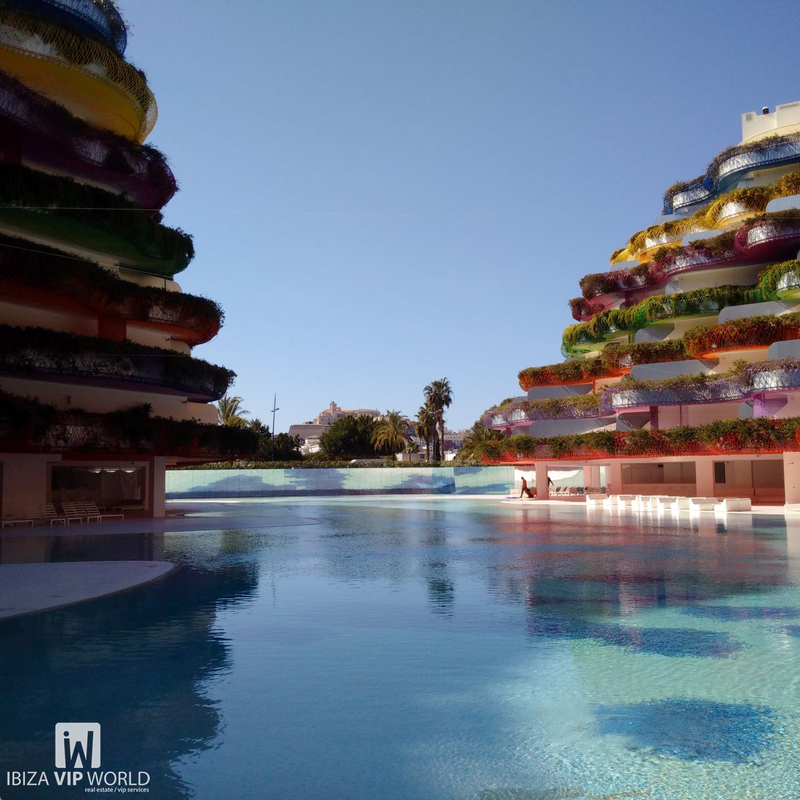 Copyright © 2016 Ibiza VIP World. All Rights Reserved.